This past Sunday, Chris and I went to Village Tavern in Winston-Salem, NC for Brunch. Village Tavern is what I would consider to be a nicer restaurant, perhaps on the same scale as a Longhorn or Outback Steakhouse. It is a bit pricey, but the food is worth it in my opinion. A note about the format of my reviews: I find it easier to break my reviews down into a series of categories. If there is a category you would like me to add, or one you feel is unnecessary, please let me know in the comments. I also score/rate the categories and provide a final score at the bottom of the entry. The decor of Village Tavern is interesting. In my opinion, the inside doesn’t match the outside. When you enter the restaurant, you are greeted by a hostess behind a large host station. The vestibule isn’t roomy, which makes waiting uncomfortable. There are a few chairs to sit in, but they are awkwardly placed. This place gets crowded fast, so I definitely recommend going early so you don’t have to wait in the crowded front entrance, or outside on the sidewalk, which is barely wide enough to accommodate two people in passing. The sidewalk issue is mostly due to large holly bushes which could be cut to allow more room for walking. The decor scheme inside the restaurant is particularly strange. The building reminds me of a ski chalet on the outside, and a “down home” restaurant on the inside. There are paintings of fruit bowls and the curtains are checked, which adds to the country feel inside the restaurant. The kitchen is visible from the dining room and is a beautiful, open space in which you can see the food being prepared. This high-end look really doesn’t go well with the rest of the decor. I would expect to see the high-end look throughout the restaurant instead of the unconventional mix of country kitchen and upper class winter home. One thing I can say about the exterior is that it does have nice landscaping. 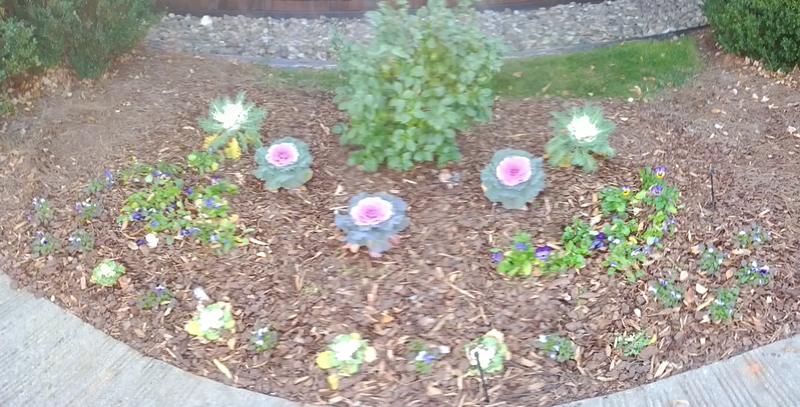 There are some beautiful plants that look like cabbages that I absolutely love. I’m curious as to what these plants are. If you know, please tell me! On this visit to Village Tavern, I would rate the service as okay at best. Although our waitress was friendly and got our order correct, she didn’t come by our table often. She also came to the table quite some time after we had been seated. We ordered our drinks and meals at the same time, but it took a long time for the drinks to arrive, and they were brought to us by another waitress. I’m happy that I sipped my drink because refills were offered after we were more than halfway through eating. The waitress could have been more attentive. Chris is a huge Eggs Benedict buff, so every time we go to a restaurant that offers a Benedict dish, he has to try it out. Village Tavern offers a few types of Eggs Benedict, so Chris is in his element. On this visit, he ordered the Crab Cake Benedict. The menu describes this dish as: Two toasted English muffin halves with our Maryland-style crab cakes, poached eggs and topped with Hollandaise sauce……$12.95. Benedicts are served with Tavern hash brown potatoes, fresh fruit and a fresh-baked apple walnut muffin with whipped honey butter. Chris commented that the crab cake element of this dish was good, but not exceptional. The eggs were room temperature, leading him to believe that they were finished before the rest of the dish and were sitting out while the plate was assembled. The temperature of the eggs distracted him from enjoying the meal. He did really like the apple walnut muffin and thought it complemented the brunch nicely; however, the honey butter was missing. The fruit was also fresh and tasty. Chris also said he would have liked more Hollandaise sauce. 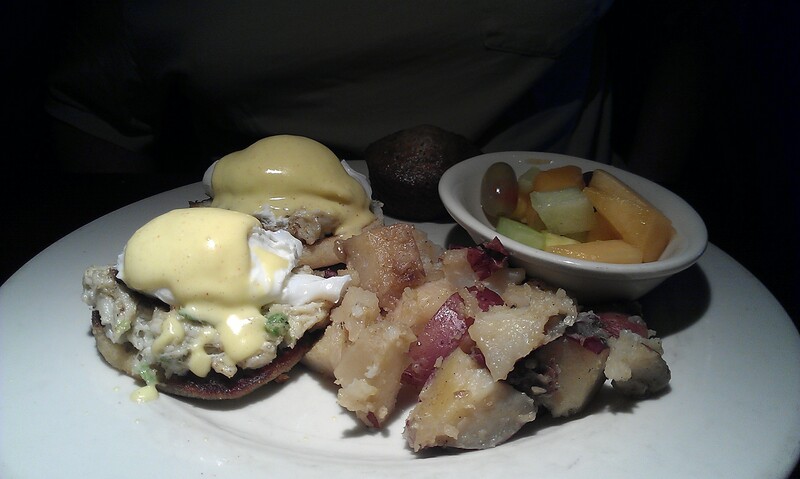 Last time we visited Village Tavern, Chris ordered the Steak Benedict (One 5 oz. filet served on a toasted English muffin half, topped with a poached egg and Hollandaise sauce…$13.95). He said the steak was full of flavor, unlike the crab cakes on this dish. He would recommend the Steak Benedict over the Crab Cake Benedict. Since I’m a cheeseburger lover (hence the name of the blog), I ordered the Cheeseburger (Mayonnaise, mustard, lettuce, tomato, sliced pickles, diced onion and your choice of Cheddar, Mozzarella, Swiss or Pepper Jack….$9.50). The menu states: We use fresh premium lean ground chuck in our Burgers, artisan sesame or whole wheat bun and your choice of classic French fries with sea salt, sweet potato fries, potato salad, pasta salad or coleslaw. 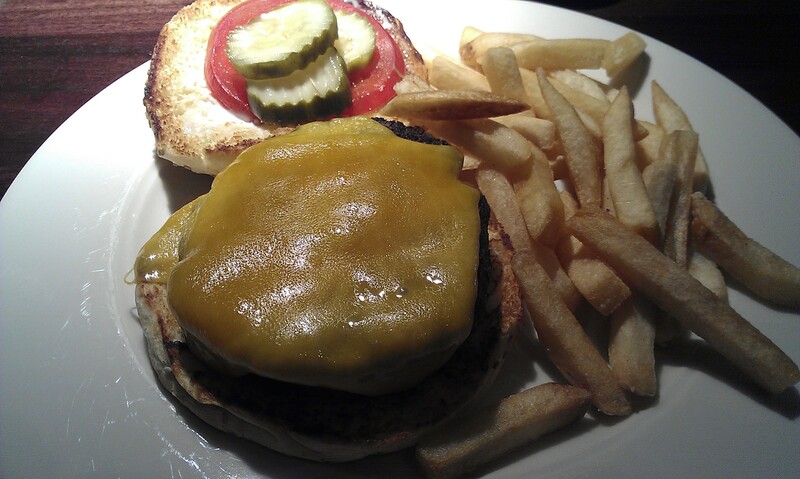 I chose cheddar cheese and ordered my burger without onions and lettuce. I picked the fries with sea salt as the side. Overall, my burger was excellent. The meat was juicy and cooked perfectly (well-done, without being burned). There was a sufficient amount of cheese and the pickles were crunchy. The mayonnaise and mustard were also applied in amounts intended to complement the burger. I usually smother my cheeseburgers with mayo and mustard, but I didn’t need to ask for more condiments since what was already on the burger was perfect. The fries were also very tasty. They were fried to perfection and not covered in salt. The only thing I didn’t enjoy about the burger was the tomato. It was a little too soft for my taste. I recommend trying Village Tavern if you’re looking for a Sunday Brunch with a lot of variety. Our bill came to $26.47, which isn’t a bad price for the quality of the food. Although, for $2.35 for a Coke, I do wish that I had more refills.